Axel Anklam's sculptures fascinate with clarity and power. Both dynamism and tranquillity rest together and alternate. Preferably, the artist uses transparent or opaque materials: stainless steel mesh, epoxy, latex. Shimmering surfaces grow over forged carcasses. With each viewpoint or light change, a transformation in the atmosphere is created, sparking a new expression each time. Axel Anklam was born in 1971. He trained as a blacksmith, mastered this field, worked as a restorer at Sanssouci Palace and attended the Centro Europeo di Venezia. 1998 Anklam enrolled at the HfKD Giebichenstein Halle. He started studying sculpture, which he completed at the University of Arts Berlin 2004. In 2006, the University of the Arts Berlin awarded him their master student scholarship. 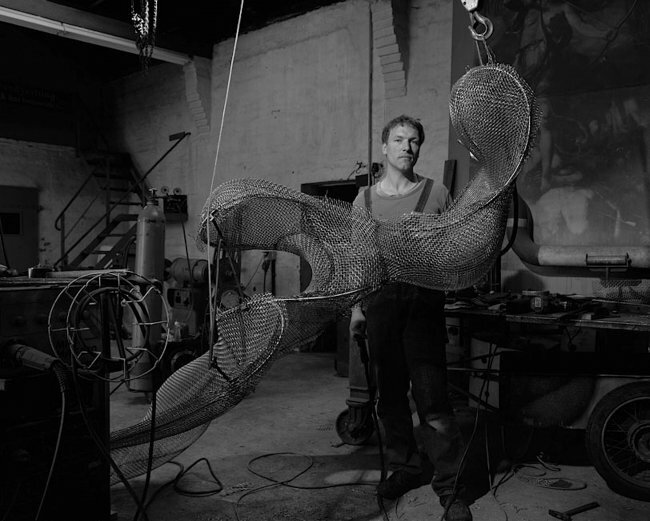 In 2004 Anklam's first sculptures were installed in public spaces - on the Hausvogteiplatz in Berlin and Bangkok in Saraburi.